TLC indoor/outdoor loose tube cable has no gel to complicate the termination process. It’s dry loose tube technology and UV resistant black jacket allow for general outside applications. OFNR or OFNP rated constructions provide the flexibility to be deployed indoors without code constraints. 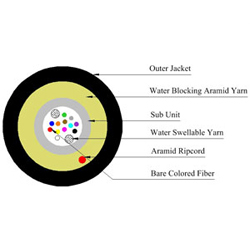 Color coded inner tubes each containing 2 to 12 fibers, allow for easy identification.